For this review, I will discuss my experience with a different type of external SSD drive. 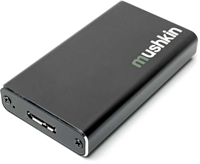 The Mushkin Enhanced Atlas FLUX USB 3.0 mSATA III SSD Enclosure Kit (AT-ENCKIT) is about the size of Zippo lighter and weighs 2.4 ounces (not including the mSATA drive that you need to purchase separately). Most people would probably prefer a regular USB Flash type drive than this type of solution. The Atlas costs about $20 and then the needed mSATA drive that fits inside can vary from $35 and up. The primary reason I purchased the Atlas, is due to the fact that I had an mSATA drive that I could not utilize for my latest laptop project. The Intel 310 Series 80GB mSATA Solid State Drive SSDMAEMC080G2C1 is an older drive that I purchased on Amazon and which I installed in the Atlas Flux enclosure. The installation is quite simple. Mushkin includes a tiny screwdriver, however I recommend using a higher quality Philips #00 screwdriver. I have big hands and it is easier to use a regular full size screwdriver when removing tiny screws as this. Once you remove the panel, the board inside should slide out, and you should now be able to carefully install your mSATA drive. You slide the mSATA drive at a slight angle and then push it down. A snap on clip then holds the drive in place, similar to memory DIMM slots in a laptop. Finally screw back on the panel and you are done. In the previous Setup for Dell Latitude E5430 post, we did most of the legwork to create a boot ready flash drive with all the needed add-on software needed to create a clean image of Windows 7 Pro 64-bit. 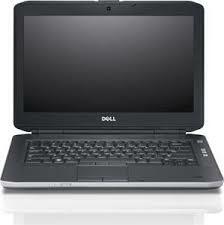 We now shutdown our machine and insert the flash drive into one of the USB ports on the laptop. If you are using the RecoveryTools 4, the Windows installation will be mostly automated. If you are not using Recovery Tools 4, then you will need to install Windows normally. I will cover both methods. The computer will come up to a text only screen asking you to start from the Windows EMS option. Then a Windows screen will appear asking you to choose a language. The next dialog will ask you to choose which version of Windows 7 you want to install. The choice is Windows 7 Professional. At this point if you are using Recovery Tools 4, the process is automated and you will need to wait for Windows to install itself. If you are not using Recovery Tools, then this is a normal Windows 7 installation and you should install Windows normally and skip to the next section. The machine will reboot and come up in Windows Audit Mode. The Sysprep dialog box will appear on the screen. Always close this box by using the X in the upper right corner of the dialog. You will need to do this every time you restart the machine. Do not click any options in the Sysprep dialog.